After my friend Carey and I did a yearly planning session, I made the concept available as a service of Farm Girl Marketing. However, sometimes it’s hard to plan a whole year out. It takes time, and you just never know how much will change as you move forward. So if planning 1-2 months ahead is more your style — I’ve now made two planning sessions available. Monthly planning sessions, or quarterly planning sessions. For each month we will specify a theme or promotion – or sometimes both! Example? Back to School Bingo or “Couples February”. We will plan a focus for marketing, promotions and blogs, as well a starting to look ahead at the next few months and trying to list out tasks that needs to be done. We will list the workshops and events that need to be entered into FaceBook, and if you want to take it a step further — we could also plan your Facebook Ad Budget at the same time! Sounds simple — right? Actually, it’s not a complex process. But it is a process that many small business owners tend to put off — and not make a priority when there are paying clients looking at you and asking for your time. 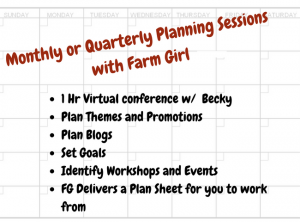 This Farm Girl planning session takes the pressure off you – just 45 minutes for a monthly planning session, and 90 minutes for a quarterly planning session, and then we’ll finalize the plan via email! 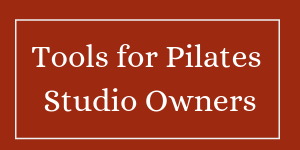 I have made a template so that this will be easy — if you’d like me to send a copy — just email and I’ll send you the PDF!! If you’d like to schedule a planning session for the next 3 months or the next 12 months — please purchase the planning session on my website, and let me know your preferred time!